A plan to turn the Dairy Queen headquarters, which will soon have a lot of space, and surrounding 12 acres of land in Edina into a multifamily housing development was rejected this week by city officials. Developer Lake West Development LLC had proposed for the building, located at 7505 Metro Boulevard, and the rest of the surrounding area to be the site of potentially more than 600 housing units. The first phase was supposed to include the existing Dairy Queen office building, which would have been used for 135 units of affordable housing apartments, and a new 150-unit building. Future phases could have included remodeling an existing office building and construction of two other buildings. Overall, there would have been about 50 units of housing per acre with 27 to 33 percent of the units dedicated as affordable housing. Lake West had requested an amendment to the Edina Comprehensive Plan to allow the area that has been designated for offices to also have residential development. The developer would still have had to go through the process of having their plans further reviewed by the city. However, city staff was not supportive of the change saying that the city’s sewer system was at or near capacity and wouldn’t support housing. Last week, the planning commission agreed with city staff and rejected the amendment. On Tuesday, the Edina City Council voted to deny the amendment. Out of the 21,000 housing units in the city, only 318 are considered affordable units or 1.5 percent, said Perry Ryan, a vice president of Lake West, based on information from the city’s website. “This project is adding 151 affordable units just in phase one which is a 47 percent increase,” Ryan said. But while the council did discuss the merits of more affordable housing, City Council Member Kevin Staunton said it was difficult for the City Council to approve the amendment without having developed a small area plan or gone through any other details about the potential of the site. “It’s difficult for us to approve this without having thought about what all the possibilities could be,” Staunton said. Dairy Queen, which owns its office building, plans to move its headquarters close by to Bloomington early next year. The CityPlace retail development in Woodbury has sold for $77.8 million, according to an electronic certificate of real estate value available this week. 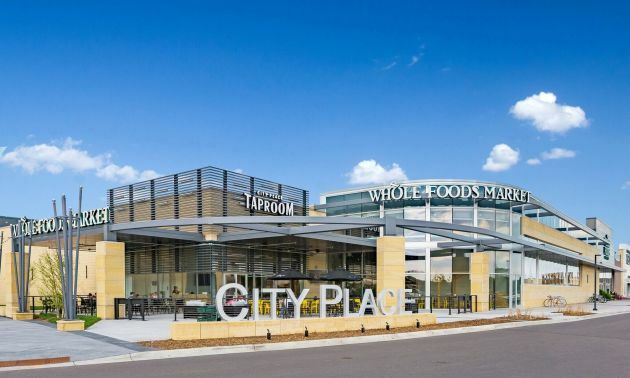 CityPlace, the former site of the State Farm office campus, was recently developed to include a retail center that includes a Whole Foods, Nordstrom Rack and several other shops. CityPlace is located off Interstate 94 close to Radio Drive. Managing principal Juan DeAngulo of former owner Elion Partners said last year that Elion had tried to “stay away from too much big-box” and incorporated non-traditional stores that fostered experiences like kitchen supply store Sur La Table, which also offers cooking classes. Besides retail, the 100-acre mixed-use development also includes other uses such as a 75,000-square-foot Tria Orthopedic Center and hotels with plans for additional office space and possible housing. The sale only includes the retail portion of the development. The buyer is an entity associated with the Illinois-based Inland Real Estate Group of Cos.